Qi Gong is an ancient art, which is thought to have given birth to many of the Chinese sciences, such as Acupuncture and Traditional Chinese Herbalism. The word Qi Gong simply translates as “Energy Work”. Qi Gong is a way to cultivate and circulate internal energy. Qi Gong is similar to Yoga and Tai Chi in that it involves postures, movements, breathing and meditation for healing and health promotion. Qi Gong is unique in that it is more energy and movement focused than most forms of Yoga, and does not involve holding difficult postures. Qi Gong science is the foundation from which Tai Chi was developed, the focus is on fundamental well-being and self-healing. Bring a friend & receive $10 of your class fee. 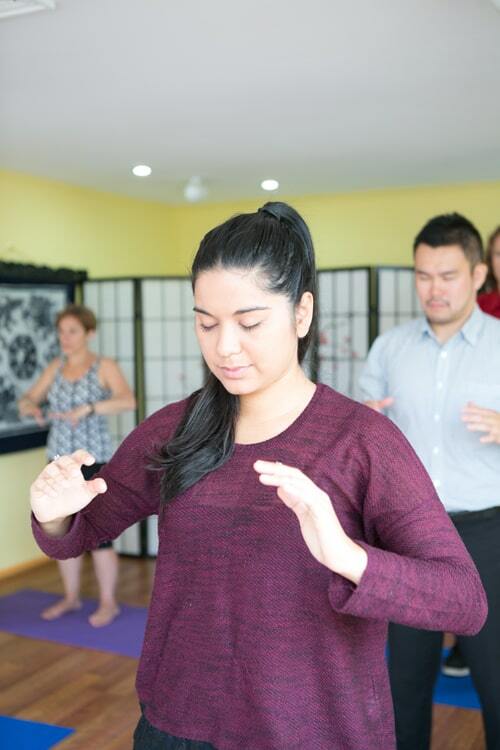 In this class you will learn movement, breathing & stillness exercises to greatly improve your health. Booking essential. David Shepherd is super experienced & will be teaching this class. Click here to read more about the instructor. Call us on 9486 5966 to inquire or book online here. Join Dr. Elaine Hickman in this 1 day workshop & reap the benefits for a day, a week or years potentially. Elaine will give you the foundation to be able to benefit for years.